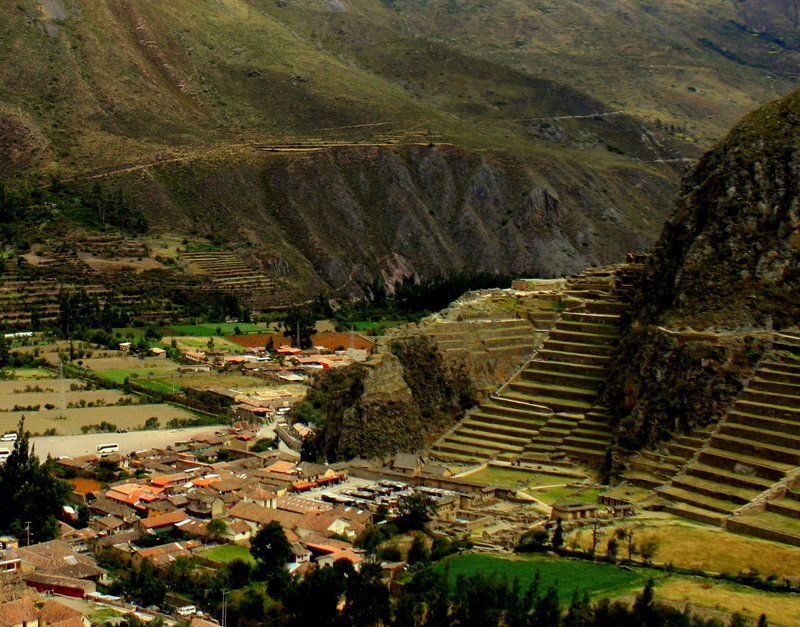 Ollantaytambo is where the Inca ruins come most alive. 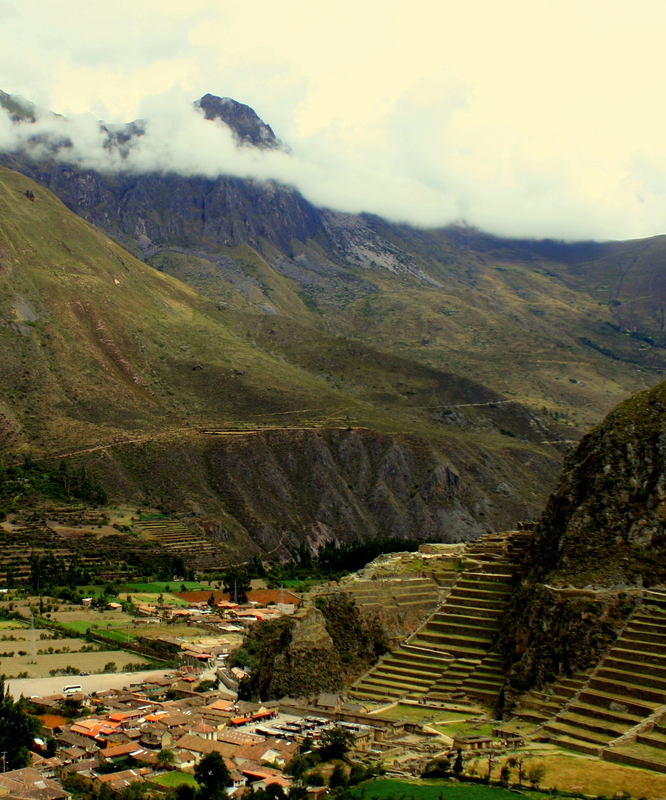 Here the terraces creep down the mountainside to the very edge of a town in which many Inca structures survive and have been continuously inhabited by their descendants. 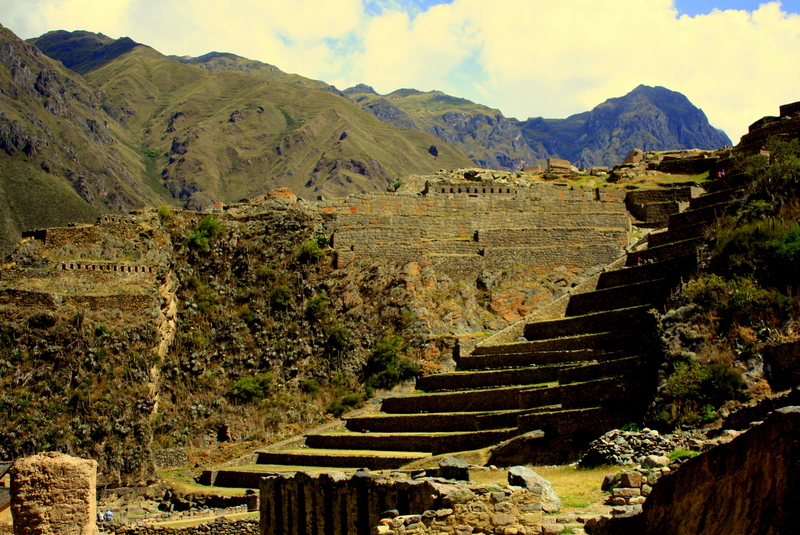 It was also once a stronghold of the last independent Inca ruler, Manco II, during his eight year rebellion against the Spanish that ended deep in the mountains at Vilcabamba. 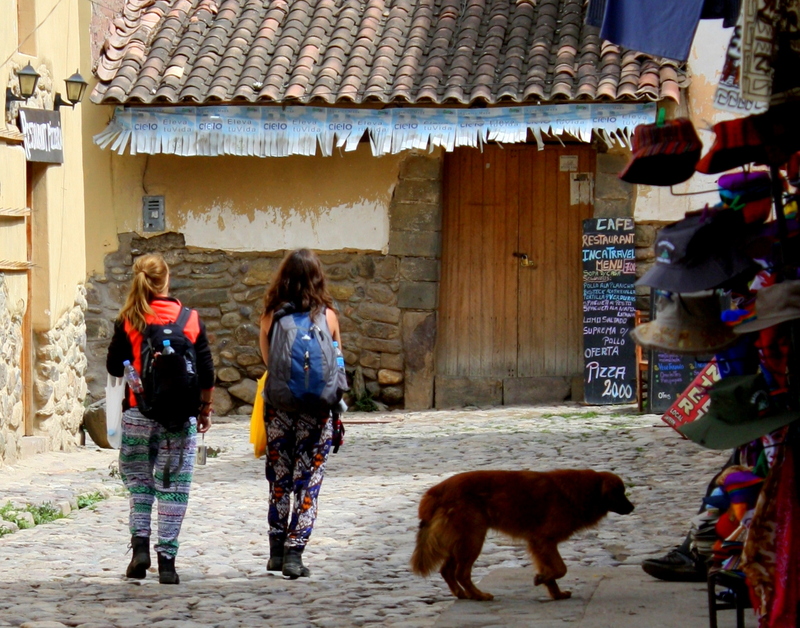 It’s also a popular stopover for the many backpackers who pick up a connection to the last leg of the Inca Trail just a few miles down the track. Those hikers not staying in any of the town’s hostels or lodges cluster around the wi-fi cafes, lounging on their packs and checking email on their iPhones. 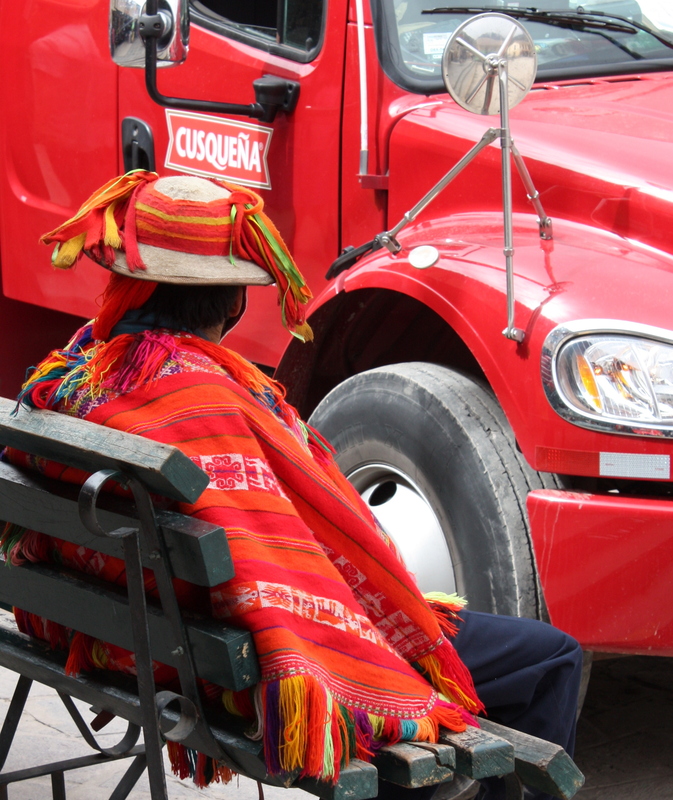 Man in native dress sits next to a Cusqueña beer truck. 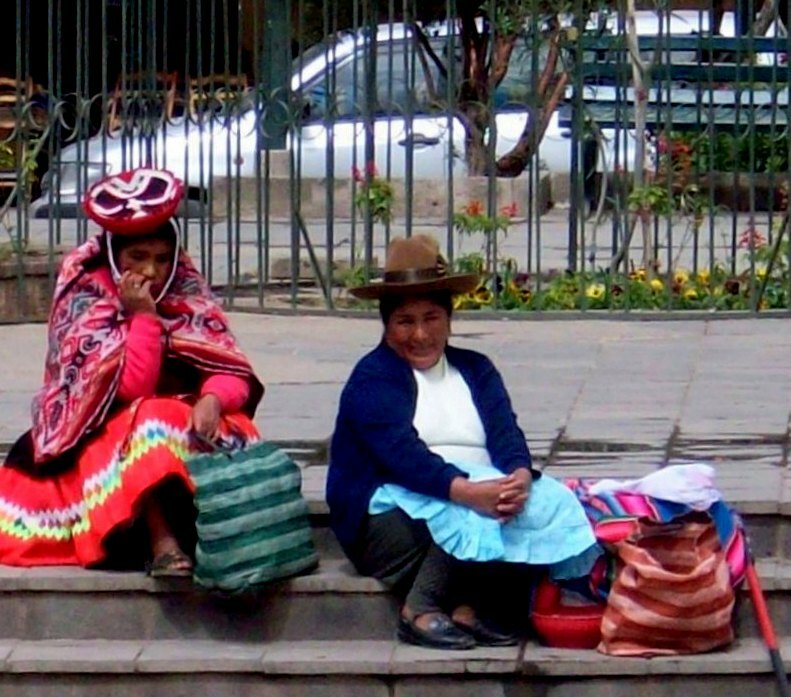 On the central plaza, a man in native garb sits, chameleon-like, next to a Cusqueña beer truck of the same color. The brew, a lager style, is Perú’s most popular beer, although at least two microbreweries now operate out of Lima. Across the plaza, women in native dress offer to pose for pictures. Even after only a couple of days in country, the differences in dress among the native peoples is already beginning to sort itself out. 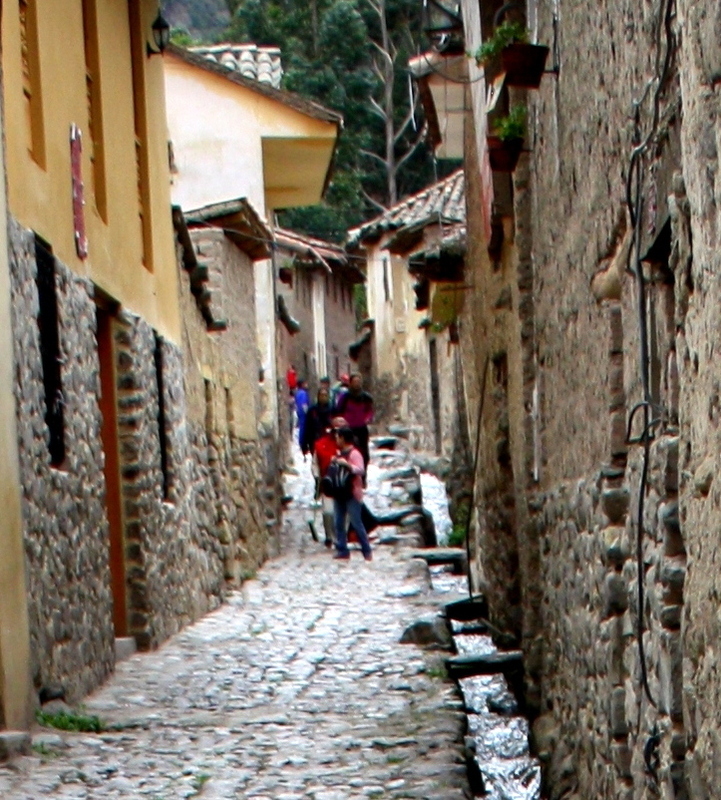 Ollantaytambo’s narrow streets appear unchanged since they were built by the Inca. They pass between signature walls of stone rising a full story and fitted seamlessly together without benefit of mortar. Aqueduct gutters along each lane still carry fresh water from the mountains as they did when first built. Only the telltale design of Spanish Colonial structures erected on these foundations testify to the Conquest. 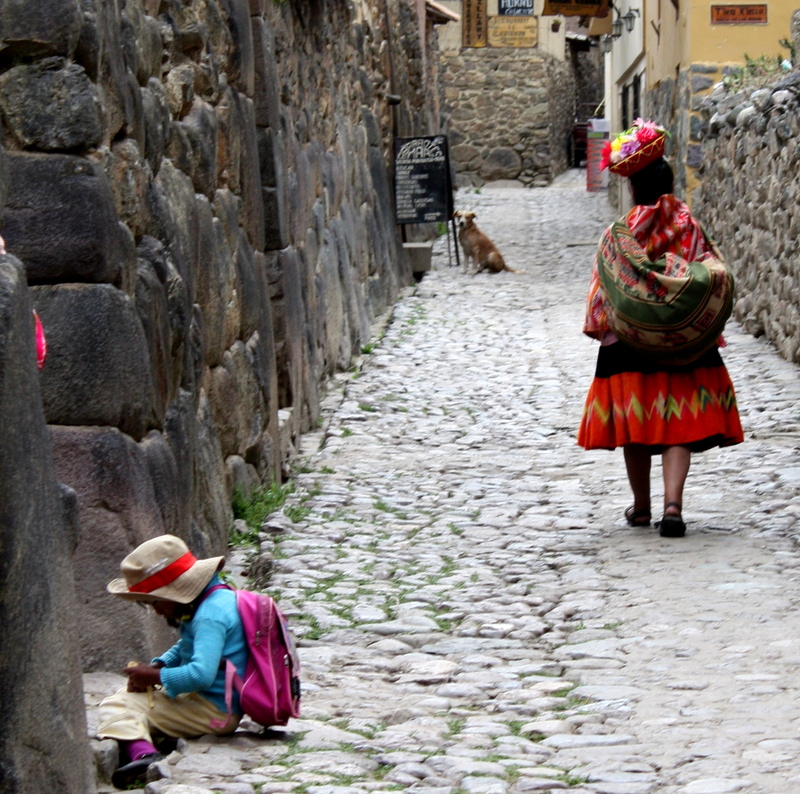 Ollantaytambo seems to absorb the visitor into a time warp. It’s often possible to stand at a corner and see nothing in any direction that gives a hint of the five centuries that have passed since people first walked these streets. Entrance to traditional Inca home. 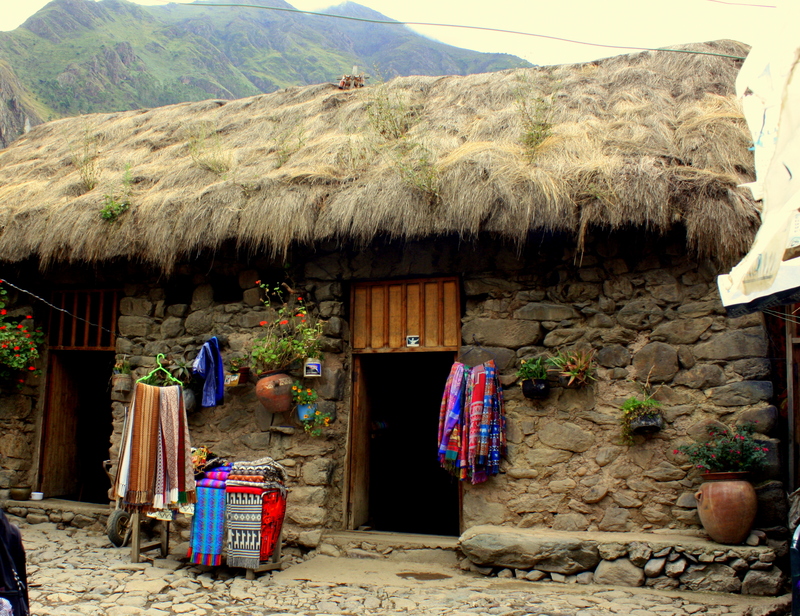 One home is occupied as a living museum in which the caretakers live just as their Inca ancestors once did. Corn is only one of the foods air-cured by the Incas. 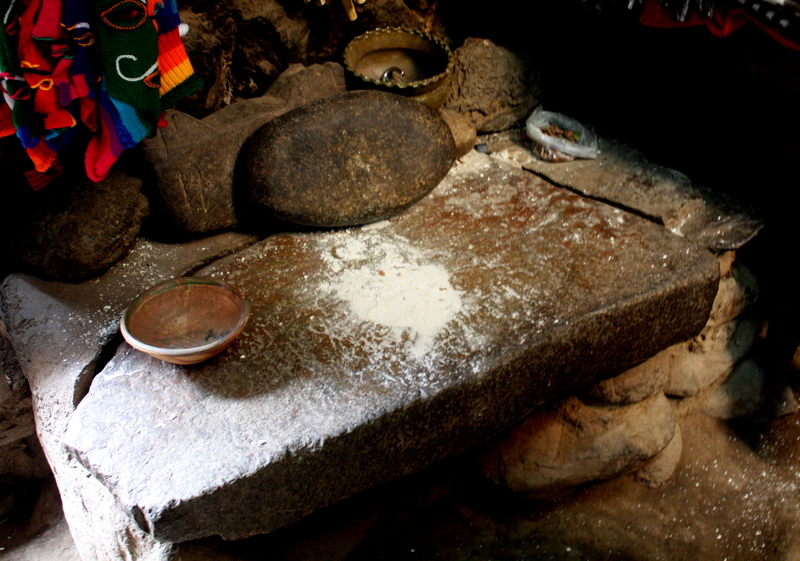 Stones used to hand-grind corn. Worn stones bear witness to centuries of corn tediously hand-milled. 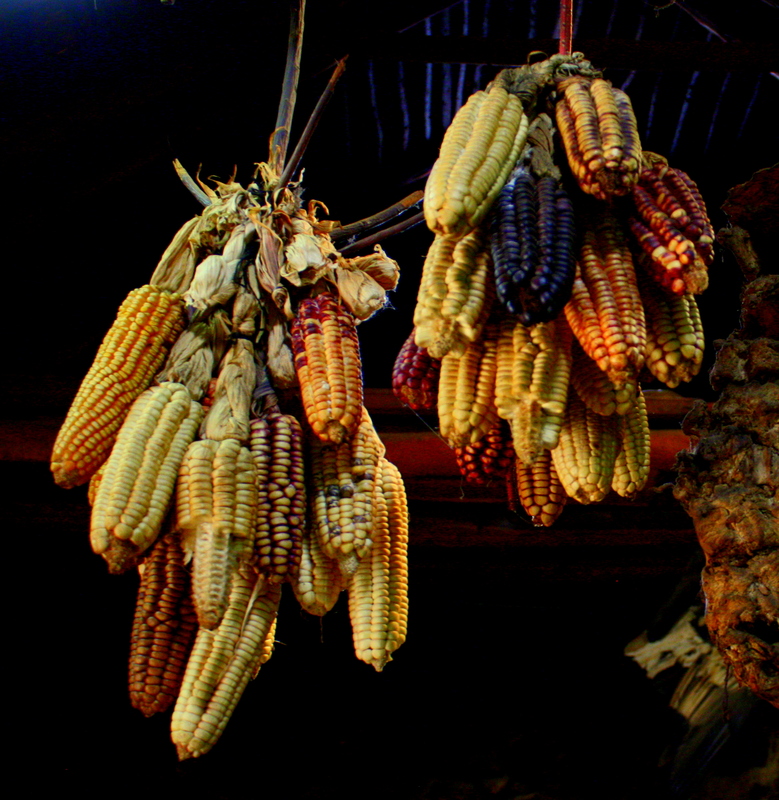 Corn has been a staple in the Peruvian diet for over 3,000 years, and many varieties are unique to the area. It’s used to make everything from bread to chicha morada, a refreshing, non-alcoholic beverage made from boiled purple corn. Guinea pigs – cuy – on the hoof. Guinea pigs graze on the dirt floor, fattening up for their unforeseen slaughter. These animals are native to the region, and have served as a source of protein among the indigenous peoples for thousands of years. Guinea pig – cuy – is still to be found on Sacred Valley restaurant menus . 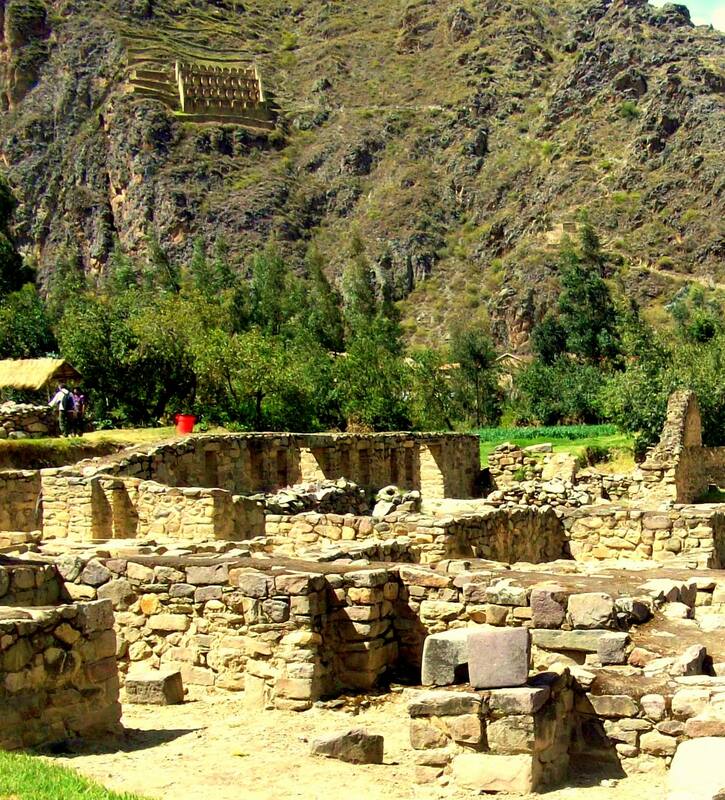 Main ruins in foreground, Inca granary in background on mountain. Most of the archeological site lies on the west end of the town, but a trail up the mountain opposite it leads to several isolated structures above. A climb to explore them offers a tempting opportunity for a panoramic view of the entire area that’s too much to resist. These granaries stand about 50 tall, placed to take advantage of cool, dry breezes. The climb along a narrow trail with steep drop-offs ascends several hundred feet and the hike takes around half an hour. The buildings that were barely visible from the town below are now revealed to be granaries, each silo standing nearly 50 feet tall. View of the main ruin from the slope opposite. The hike is worth it, though, because the main part of the site is spectacularly visible in its entirety from this vantage point. Town in foreground, ruins to right, quarry on the cloud-covered mountain. Towering in the distance across the river is the cloud-wrapped peak from which the stone for this monumental construction was quarried. As I survey the panorama from my perch at more than 9,000 it crosses my mind that the Egyptians had to contend with no mountains when they hauled the massive stones with which they built the pyramids. 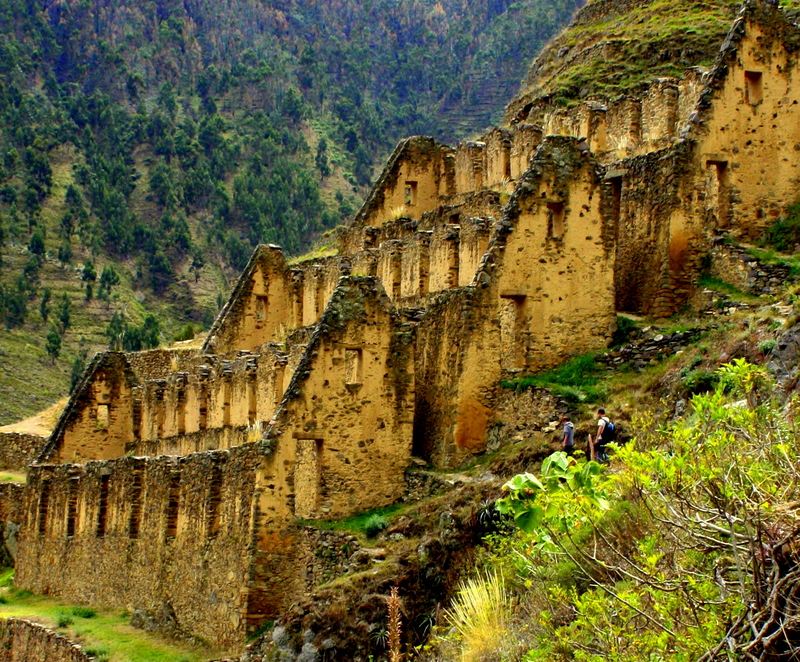 I can be only more impressed by the Incas’ ingenuity and perseverance. My train to Aguascalientes and Machu Picchu leaves at mid-day tomorrow, and I’ve got an idea about what to do with a free morning. Come along and see.